Opening Friday February 17 at Victori + Mo Gallery, 6 pm to 9 pm. On view through March 19. 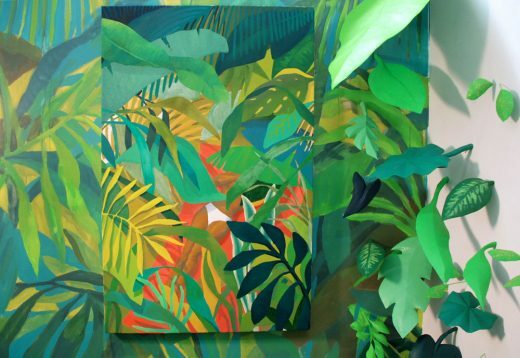 It’s a jungle out there, but at Adrienne Elise Tarver’s latest solo show at Victori + Mo, it’s also a jungle inside. Taking cues from her interpretations of artists like Gauguin and Rousseau as being “problematic in their treatment of other lands and people, either by painting what they have not seen, or overly sexualizing the bodies of the locals,” Tarver has created a directionless and stimulus-filled environment that subverts the traditional white cube gallery setup, where it is clear which ways to politely move through the space and what to look at. In Secrets of the Leaves, paintings hang and leaves protrude; it’s unclear where to position your body or what to focus on. You’re faced with what the artist calls “moral voyeurism.” Should you be training your eyes on the scantily-clad woman among the leaves? Or would it be better to just focus on the greenery? Opening Saturday February 18 at Be Fluent NYC, 6 pm to 8 pm. On view through March 25. Since the election, art shows inspired by or reacting to it have been nearly a dime a dozen. Even recently, there’s been IMAGE Gallery’s Planned Parenthood benefit, the Angry Women show at The Untitled Space, and Knockdown Center’s sprawling group show Nasty Women, just to name a few. This group show presented by Field Projects isn’t specifically election-centered, but one could argue that everything done nowadays is done with regard to the reality we are currently living in. So, this show of work by female artists working with the female figure isn’t just that. It’s a show of female artists working with the female figure “in a post-Trump world.” Will “pre/post-Trump” become the new “BC/AD”? Only time and history books will tell, but in the meantime consider supporting this lively group of women artists and their unique artistic creations. Opening Sunday February 19 at Richard Taittinger Gallery, 9 pm to midnight. No More Black Targets is a collective with a unique and specific objective: to eliminate the use of “human black targets” at shooting ranges, which are the black silhouettes on paper that shooters-in-training are taught to aim at. The group argues that this practice has led to an unconscious bias in firearm users, contributing to the grim statistic that “young black men are 3 times more likely to be shot by trained shooters than their white peers,” data that is supported by a University of Illinois study on trigger bias cited on the group’s website. But how does art factor into this all? 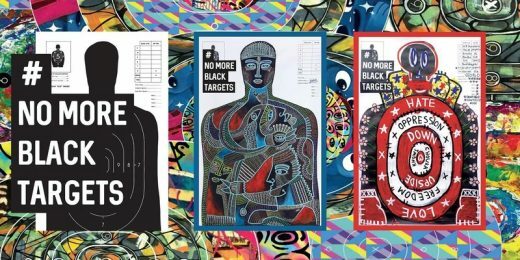 The No More Black Targets collective is largely comprised of artists and creators, who use these very black silhouette papers as foundational material, making art directly on top of it and transforming the very thing they see as a danger into something beautiful. 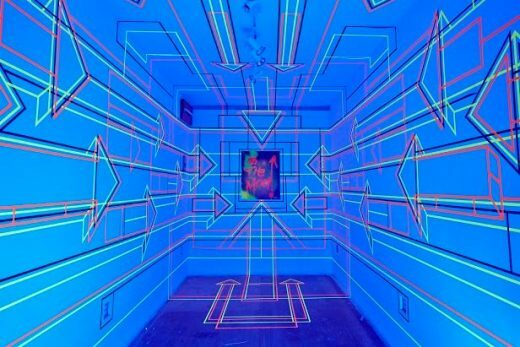 Fresh off an installation at the New York Society for Ethical Culture, the group is bringing their work and ethos to a Lower East Side space for one night only.